Sleeves - Need Hardened Sleeves Or Slitter Knife Shafts? Shop Today! 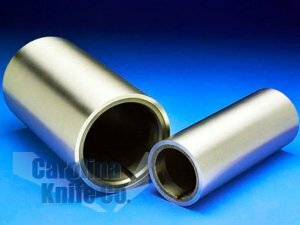 | Carolina Knife Co.
Carolina Knife Company manufactures through-hardened sleeves and slitter knife shafts for all major equipment manufacturers, as well as custom sleeve and shaft designs to fit your specific cutting needs. A hardened sleeve can boost performance and enhance longevity of industrial slitter blades. Sleeves that are appropriately hardened can be reground several times, enabling a longer operating time. Made from chrome-alloy steel, our hardened rolls come standard with a hardness of 63-64 RC.